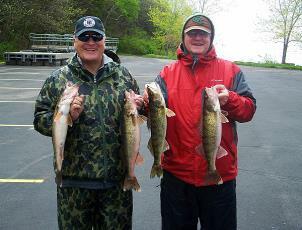 Thanks for sending the excellent pictures of the magnificent walleye you guided us to on Green Bay on May 8 and 9, 2012. You have walleye fishing down to a science and your boat was perfectly set up for trolling for walleye. Also thanks for guiding me to catch sucker and pike, as a little variety is always good. 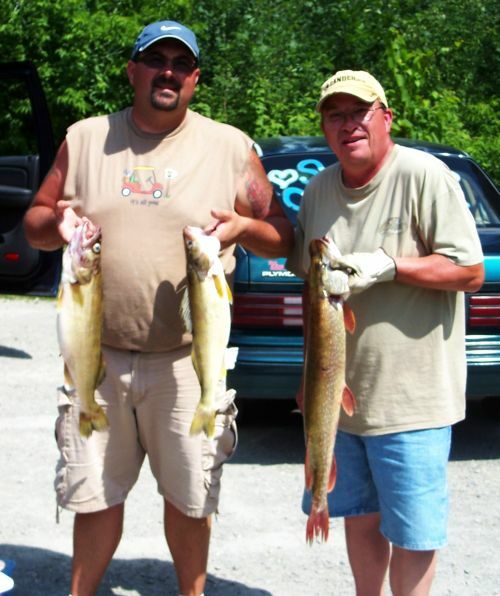 The 27 inch walleye was the largest I have ever caught and Gene and I were amazed at the number of 24-26 inch walleye in our catch. Not only was the walleye fishing the best we have ever experienced but you are by far the finest fishing guide and Captain we have ever had the pleasure of meeting and enjoying the walleye fishing with. We will definitely be back when the smallmouth bass and Muskie are in season. 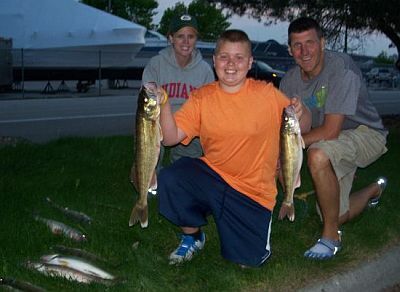 Thank you for the wonderful fishing experience last weekend while we were visiting Green Bay for the Marathon. This was the highlight of our trip and will be hard to top the rest of the summer. Despite the weather conditions changing, you took the time to find some good fishing spots where we caught some of our largest fish ever to date. I would highly recommend Captain David Mydlo of "Fish Anytime" to anyone from Novice to Experienced and Adults to Families. David will customize your experience to your exact needs and interests. Also, he was more than willing to meet us anywhere in the area and provide detailed driving directions. He was more than willing to help answer any questions and provide perfect fishing tips that will be helpful now and long into the future. Also, David provided the option of filleting the fish for us after we returned to dock! This was perfect. We kept the fish on ice and enjoyed a great Wisconsin Walleye Dinner when we returned back to Indiana. We look forward to a future opportunity to visit in the future. I wanted to write and say thank you for a wonderful experience. I have been to some of the best places in the Northern United States for walleye fishing and Green Bay is by far the best in my book. Also, I have yet to be so lucky to have a charter where the guide was so passionate about fishing and knew exactly what he needed to do at every point in time; with your quality equipment and experience I have never had a better guide take me out on a boat. I was amazed with how often we were catching fish and the quality of the fish, and you were disappointed that the fishing was slow. Once again, I wanted to thank you with much gratitude and can't wait to get back out on the water with you again soon. I will with no doubt recommend fishing with your charter to all my friends and family.